Elfie steps off the train into the sultry Sommer Abend air. She has travelled mit der Bahn from London, via Brussels und Frankfurt, and ist tired nach her fourteen-hour journey. Her mother has sent her to Linz to spend ein bissler zeit mit her Onkel Zav auf the off-grid, permaculture boat Eleonore – home to a Kollektiv of alternative, grassroots, Wasser-loving, Öko-enthusiasts living their dream in the centre of Linz. Her uncle, who was to return von his Urlaub am nächsten Tag, sent his friend, Suzanne, to pick her up. It takes time for Elfie und Suzanne sich zu erkennan, aber, eventually the Zwei make eye contact and say hallo. Suzanne has lange braune haare and wears an all-in-one patterned jumpsuit, a little more exötische than Elfie’s own gewöhnlich striped top and demin trousers. Elfie wishes that sie could auch look so toll aus. Like many twelve-year olds, she is interested in female role Modellen, women she can imagine herself becoming als ein grownup. Elfie was not the name she had been born with. She had chosen it fünf Jahren earlier, and it had stuck, wie Klebestoff. To Austrian ears it sounds slightly altmödisch, but she loves the name and insists on being called by it. In the car, travelling to the boat, the young girl tells Suzanne about her journey von London: how the Deutsche farmhouse roofs were covered with solar panels, how she had finished reading her book and had bought a hot Schokolade in Brussels. The woman tells Elfie about her Arbeit als documentary filmmakerin, how she makes anthropological films, and that she had recently screened her work in London. This is Elfie’s erste time in Linz. Well, actually, she thought she had been here einmal vorher, aber hat falsch erinnert, mixing up Linz mit Krems. She hat nie lived on a boat before. Would she feel seekrank? On arrival, Elfie carries her bag over the slatted Holz bridge onto Eleonore. In the halb-darkness she can see Pflänzchen, Sonnenblumen, a giant umbrella-shaped radio antenna and the outline of a huddled group of people. She is greeted by die Donauten, who are seated on the deck, drinking bier and enjoying the evening breeze. Introduced one by one, she shakes each by der Hand. Die Donauten are members of the Kollektiv who oversee the boat and meet here every Monday night. Their name comes from Donau, the Austrian name for the Danube. It seems auf ersten Blick that die Donauten not only like being on water, but drinking it too, in the form of bier, most und Schnaps. She asks for a bier and is given one. Wasser. Es gibt viel hier. In a harbour on the Danube in Linz, Österreich. The houseboat offers the possibility of a different kind of life: off-grid and auf’s Wasser. Although gently moved by swelling tides and passing boats, she is ostensibly static und nicht for travel. Since she is engineless, moving would require ein ganz andere boat to tug her. Her schwarz iron hull sits aufs Wasser, und soft undulations connect her Einwohner to the river’s volume below; ein konstant lilting-sway, accompanied by the Geräusch von lapping water. Sie geht unter, we go down; sie kommt wieder nach oben, so do we. Around her hull, Eleonore wears a skirt of decking that makes it possible to dock canoes, motorboats and kayaks neben an. These moored boats, tied with expressive sailor knots, float next to a white ladder das hilft swimmers steigen in und aus of the water. The craft has been renovated with donated and found materials, and it is these wires, bolts, slats and boards that hold her firmly zusammen. Elfie feels zuhause. Suzanne shows her how to fill the toilet cistern, one of the wichstigste jobs on the boat. The selbst-gebastlete cistern is a bright-blue plastic container that has been screwed to the external wall, its bottom removed and spout facing nach untern, so that water feeds through a tube into the main toilet cistern, innerhalb des Schiffes. Next is a demonstration of how to gather river water. This is done by standing on deck and throwing a bucket on a rope into the Danube, and then pulling it out again once voll. Using Flusswasser to flush the toilet means precious regen wasser is saved for other purposes. Elfie wonders wo the poo und pee geht, but ist zu müde to ask. She will find out tomorrow, but for now she heads to her cabin and lets herself be lulled to sleep by the boat’s gentle sway. ‘In der grosse Tank dass sitzt direkt unter the toilet,’ he answers enthusiastically. ‘But wo does it go then?’ she persists. He has to leave, to go to Arbeit, which her mother had told her hat irgendwas mit computers zu tun. Leaving the key to the boat, etwas zu essen und important telephone numbers, he says he will return that afternoon to see how she is. The prospect of having the ganze boat to herself for the day excites Elfie and she decides to become a detective. She will explore the boat and find out how Wasser is distributed throughout. There are clues to the logic of the boat’s Wasser system in diagrams she discovers in the logbook, und obwohl sie finds it hard to verstehen all the Austrian words, the drawings are kristall klar. She can see that the main source is rainwater, which is collected on the newly built plastic roof that covers the deck, before being directed onto the boat’s original, smaller iron rooftop, where it is channeled through grüne Schlänge to the back of the vessel and stored in zwei Plastik tanks. The diagrams show how the rainwater from the riesen gross storage tanks fliesst into the lower-level kitchen, wo it is used to cook and wash dishes. There is also a wasser filter here that cleans the rainwater, damit es ist fertig zu trinken. The bathroom is at a higher level than the storage tanks, and so an elektrisch pump ist benützt zu force the rainwater up, into the insulated tank high above the boat. This airborne tank is connected to the radiator on the boat’s Dach, which in turn heats the Wasser. Unlike household radiators, where the wasser heats the room, this radiator absorbs sunlight to heat the liquid inside. It is exactly the same size, Farbe, Dimensionen und sun-facing angle as the nearby solar panels, which it can be easily mistaken for. Heat from the Sonne during the day means the Wasser ist warm in the evening und kool in the morning. Elfie is currently on a shower Urlaub and has no intention of washing during her stay. In fact, she und Onkel Zav have already made a pact not to wash for three weeks. They say that they want to save wasser, aber wirklich the Onkel und niece just want to enjoy their own stink for as long as possible. There is nicht genug Regenwasser for the whole boat, und river Wasser is used for most activities not related to food preparation. Zum Beispiel, the toilet is flushed with river Wasser, which is also used to quench the thirst of the lettuces, Tomaten, Erdbeeren, herbs and sonneblüme that share the deck with the boat’s human inhabitants. Having studied the plans, Elfie geht auf deck to observe the pipe system winding its way across the boat’s Oberfläche; green, gelb, grey, weiss, schwarz und rot pipes, which dangle, hang and stretch across the boat’s metal shell. Wasser und pipes run internally and externally, around ecken, unter decking and über köpfe, durch ad-libbed elbows, taps, reducers, valves, tubing, Ts, crosses, caps, plugs, barbs und fasteners. The Schläuche are joined in near-infinite combinations that enable Wasser-flow into, through and out of Eleonore. Having made herself a Tasse von Tee, Elfie sits looking out to the harbor and eats a couple of handfuls of red tomatoes and strawberries from the deck in a spontaneous Mittagessen. Lecker. Lots of Leute zip back and forth on motorboats and canoes. She waves at them, and they wave back. Their boats make waves too. Wellen, quellen und winken. The Hitze, breeze and gentle rocking of the boat makes her tired and, lying down to rest, she falls asleep to the sound of water. In her pipedreams she dreams of pipes, although jedes Stück is made from a different material: a wilderness of infinite and uncontrollable Schläuche, channelling liquid around, over, unter and across each other. In an attempt to tame these unruly thickets she hacks them back with her pencil. Mit Bleistift und Papier, she uses perspective and shading to conquer their boisterous forms and creates a series of drawings of pipes transforming into botanical plants. Aber soon their organic forms become orgasmic and the phallic pipes, no longer contained by the page, begin to twist, turn and curl off the paper, moving into three-dimensional Raum. Wasser begins to flow through them, dripping, splashing and spurting. She wakes up. That was an odd dream. Not unpleasant, just strange and full of new unbekannt feelings. Durstig from her experience, she holt ein Glass Wasser and drinks it down in gulps. A boat is gendered: Eleonore ist ein vessel. Sie is weiblich. Technical descriptions of pipes often refer to männlich or weiblich Teilen, a vocabulary that evokes the human body. The masculine pipes and feminine vessel that is Eleonore have wahrscheinlich lodged themselves in Elfie’s teenage psyche, prompting her outburst of unconscious desire. Sehnsücht. This war nicht ihre erste erotish dream, but is still the most graphic evocation of sexuality she has experienced. Re-invigorated, Elfie continues her exploration, this time swimming around the boat, and looking for ways that drains kommt ins Wasser. Putting on her new, bright-red swimsuit she jumps into the grünes harbour. Swimming around the boat, she sees ein Loch directly unter the kitchen sink. It must be a drain. 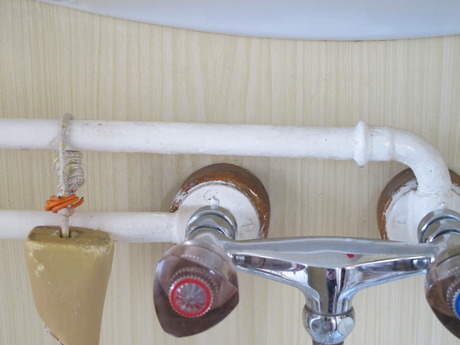 Continuing, she observes two hosepipes running from the Badezimmer into the river; these are the pipe concoctions that drain Wasser von the sink und shower. It begins to regnen. She floats, like Eleonore, her body flat. Facing a clouded sky she feels rain falling onto her face and hears Wasser tröpfeln as they hit the river’s surface near her ears. Onkel Zav ist zurück. Greeting him from the wasser, the niece asks ob ihr Onkel could do the washing-up, damit sie can see the Abfluss flowing from the boat’s drain into the harbour. He agrees, and rinses the single plate and two mugs left from their Frühstuck. Treading water, she observes the bubbling liquid as it dribbles from the Loch in the boat’s hull into the water below. While climbing back onto the boat Elfie denkt about how water appears and disappears at home, thinking that it happens without much thought or imagination. She likes the colourful pipes that cover the boat and wonders if her mother might let her do something similar zuhause. In the evening, die Donauten reappear, beckoned by the call of water und Bier, and resume the moistening of themselves from the inside. As darkness surrounds them, water sounds can be heard more deutlich: a dripping tap, lapping edges, gurgling stomachs, burbling voices, the drone of water being pumped into a tank. It begins to rain. Elfie ist müde. Warm and dry, she lies down on her bed in the boat’s hull. There are distant voices above, and as raindrops unite with the boat’s hull to make metallic music she allows Eleonore to seep into her dreams noch mal – for one more time. Once asleep, she drops vertically into a lange, dunkel smelly pipe, barely touching its damp und schleimig sides in her freefall. It is pitch-schwarz as she hurtles downwards, her limbs bumping and scraping against the pipe’s innards. On slowing, she uses her hands to feel her position at the junction of a metal pipe und plastik tube. Thud. She lands on a ginormous blade of grass and immediately sees that the traum has transported her to her home in London. Looking-up, she notices solar panels auf the roof of the four-storey block, and a rainbow of pipes that cascade water down into all the kitchens and bathrooms. Instead of a car park, there are raised beds where people are growing gemüse und blumen. To her surprise, alle the buildings have been similarly refurbished. Like Onkel Zav, her post-consumer neighbours have used DIY Energie to reclaim common resources from the stranglehold of reeking corporate polluters, so that they might live more economically and with less impact. Stunned, she looks inside the pipe that delivered her, und is immediately sucked up into its back-draft. The reverse journey takes seconds, and on her expulsion from the top of the pipe Elfie wacht-auf in ein pool von ihr eigene sweat.